As rightly pointed out by Tim Kastelle recently, it’s imperative to distinguish discovery from execution when it comes to startup and innovation activities – bearing in mind that both purposes are complementary and equally important. Along with the case made in my previous post, this suggests following a dual approach to balanced corporate innovation management. The main objective of dual approaches is to sufficiently separate exploration-/discovery-oriented initiatives from exploitation-/execution-oriented ones (e.g. in terms of dedicated tools and metrics to be applied) while at the same time ensuring an appropriate degree of connection and proper interplay among both parts. In the following, I will outline a model that attempts to help organizations implement a dual approach to innovation management. This model uniquely condenses and combines learnings from recent research in this field as well as experiences of my own work with diverse companies in various industries. It aims to integrate objectives, activities, requirements and inherent tensions along the innovation spectrum as well as enabling aspects, often being discussed independently from each other. Therefore, it’s titled a model for integrative innovation management. Exploitation-oriented initiatives are related to running core business by executing and enhancing existing business models or technological capabilities. The primary direction of impact is value capturing (commerzialization). Examples: Product, service or process innovation, portfolio extension, innovation of selected business model components (e.g. channel or operations), market research. The target portfolio including new initiatives is derived from a strategic growth gap analysis. In order to fill an identified growth gap, a company needs to start exploitation- or exploration-oriented inititatives with corresponding sizes and time horizons. Premise 2: Board of Directors and executive management are committed to attributing equal importance to exploitation and exploration initiatives as both are vital for a company to thrive sustainably. This particularly implies receiving a long term mandate and adequate resource allocation for exploration and its initiatives. Probably the most critical requirement for explorative initiatives to flourish is staffing them with dedicated, high-quality full-time workers. Given that the vast majority of startups fail despite mobilizing dedication from a team that has nothing to lose, not dedicating adequate quality and quantity of workers will ultimately consign explorative ventures to failure. The appropriate ratio of resource allocation between exploitation and exploration depends in particular on a company’s strategy and environment, among other criteria. The CEO (in alignment with the entire board) is in charge to define this high-level ratio for the entire company. Exploration-oriented initatives are anchored in a dedicated exploration unit, headed by a “chief Explorer” who reports to the CEO – just as the business unit leaders. He is also in charge for governance, supported by a dedicated “corporate innovation board” which is staffed by innovation-related stakeholders across the entire company – in particular all business units are to be represented. Financing is covered by a corporate fund, following a staged investment approach. 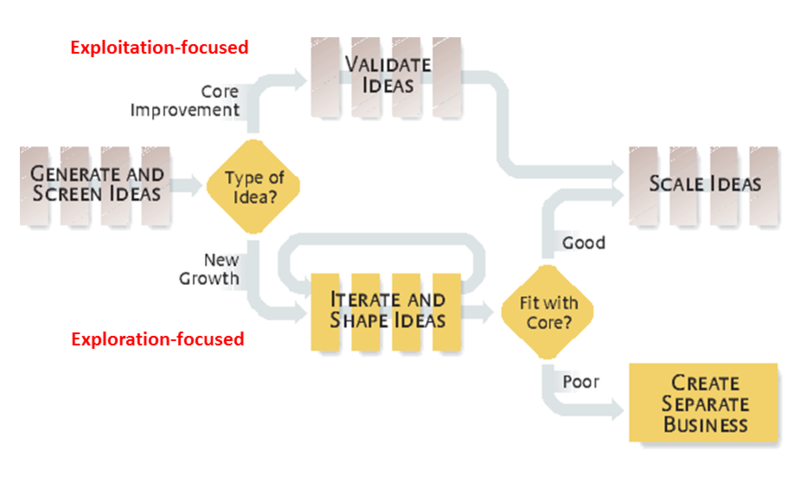 Premise 4: Fostering an innovation portfolio is enabled by a proper idea management system which allows to either assign an internal or external idea to the corresponding unit or to reject it. One common mistake of organizations is to ask employees and external contributors to generate ideas without putting mechanisms in place to act upon them. Therefore, it proves crucial to develop criteria by which to judge and process ideas – particularly including the “crazy” ones. A good example of how an idea management process could look like, is given below. The original figure is slightly adapted for our context. Whereas the upper path is taken by exploitation-oriented ideas with high proximity to the core business, the lower path holds for exploration-oriented ideas with no (immediate) fit with the core business. In order to feed the idea management system with potent and explorative ideas, a company needs to be based on an open, collaborative culture, leveraging a cross-pollinating and serendipity-friendly infrastructure and startup engagement. Moreover, each horizon is based on dedicated conditions in terms of accounting, metrics, approaches and instruments, as well as organizational and personal requirements. Upcoming posts at my blog are planned to elaborate on this more in detail. In average, the ratio H1:H2:H3 for resource allocation amounts to be roughly 70:20:10. Although this might be a good rule of thumb, a company’s actually required ratio needs to be adjusted necessarily according to its individual context and environment. H3 initiatives have been validated in terms of their success potential and are supposed to be scaled up. 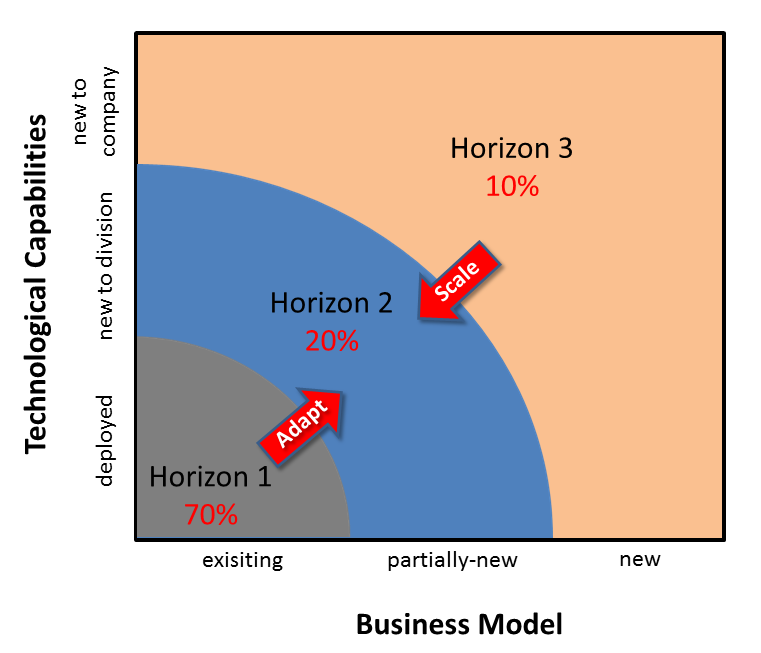 Scaling inititiatives are intended to either end up as new H1 core businesses in case of disruptive innovation or getting integrated in an existing division in case of sustaining innovation (Scale).